"Staff were welcoming and helped." 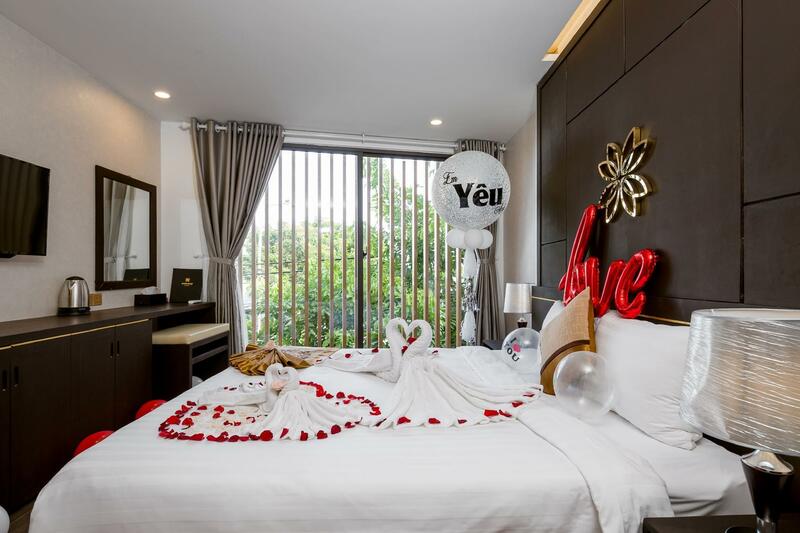 Have a question for Hanami Hotel Danang? "Everything is perfect and the hotel near to the beach." "Walking distance to local food n coffees Very near beach about 15 mins walk Clean room n surrounding Staffs very polite, helpful ." "This hotel is clean and very friendly." Conveniently located in Da Nang, Hanami Hotel Danang is a great base from which to explore this vibrant city. The excitement of the city center is only 1km away. With its convenient location, the property offers easy access to the city's must-see destinations. Offering guests superior services and a broad range of amenities, Hanami Hotel Danang is committed to ensuring that your stay is as comfortable as possible. The property provides free Wi-Fi in all rooms, 24-hour security, daily housekeeping, grocery deliveries, laundromat to ensure the greatest comfort. Step into one of 30 inviting rooms and escape the stresses of the day, A selection of amenities can be found in most rooms, inlcuding flat screen television, additional toilet, carpeting, cleaning products, complimentary instant coffee. The property offers an excellent variety of recreational facilities, including garden, karaoke. Superb facilities and an excellent location make Hanami Hotel Danang the perfect base from which to enjoy your stay in Da Nang. "The staff are all eager to please and (for the most part) sp..."
Dear valued guest, Thank you for choosing us for your holiday in Danang. We so grateful when you take your valued time to leave us this review. Firstly about the room, you booked the standard king room and we showed all of information of the room on Agoda. We really regret because you feel uncomfortable with our room. Secondly about the breakfast, we served correct on the menu breakfast and always try to help our guests enjoy the best breakfast, unfortunately the breakfast don't match with your taste. We sincerely apologize about this. Once again, thank you so much and hope to welcome you again. Located near the end of the main road that leads to one of the top 10 beaches in the world, this hotel is exceptionally quiet - although they were starting construction across the road when we left (Jan 2019) so check with the hotel for updates. The rooms at the back overlook a driver testing ground (also one of the largest green spaces in town) which is very quiet. And the front is onto the street, but little traffic, as most scooter use Phan Tu Street. The rooms could use an update, but they are clean and functional. The staff are all eager to please and (for the most part) speak pretty good English. There is a coffee shop/restaurant in the lobby - but it's pricey and no atmosphere. Do again? For the quiet and staff, otherwise....probably not. I think the location of the hotel a bit far from mall or restaurant, but you still can walk.. convenient for short trip to stay, the staff can't understand and speak english well, so its quite stressful while check in. I wont stay to this hotel if i plan to go Danang again. Dear Valued Guest, Thank you for taking your time to leave us this review. We apologize for the problems that you encountered during your stay. As you know, our hotel is located close to the beach so slightly away from the city center a bit. The main surroundings are restaurants, spa, coffee, and shopping areas for foreigners. It takes about 5-15 minutes to walk so sorry if this is inconvenient for you. About the language barrier when you check in, we sincerely apologize for this problem. At that time, the receptionist was sick, so we had to change people suddenly, we would try to improve our staff’s English, hope you can understand for us. If possible, we still look forward to welcoming you again at the hotel to show you we have overcome and improved the problem you had met that made you unhappy. Again, sincerely apologize for the inconvenience and thank you for choosing our hotel. We would like to thank you for staying with us, and sincerely apologize again for our mistake. Stayed only 1 night but think this hotel was excellent at all. Comfy beds, clean room, helpful staff and great location within walking distance to the beach. Very new and clean hotel. You can go everywhere with grabcar. From danang airport to hanami hotel only 75k vietnam dong. They also got about 8-10 menu set for breakfast. Very helpful hotel staff, they will do all they can for our request. Sure will stay here again for my next visit to danang. Dear Koh, Thank you so much for sharing your experience you had with Hanami hotel. It’s our pleasure to hear that you enjoyed your time staying here. Hanami always aim to bring the comfortable and perfect feelings for guest. We are also glad when our facilities and staff had a good impression on you. Again, thank you so much for your kind words and we are looking forward to welcoming you back. Sincerely, Hanami team. Travelling with mom and aunt. Lovely clean hotel. Staff speak okay english (most hotel accommodations in Vietnam we find have very limited English except Hanoi). Room was alright, not the most spacious for three people ( we had triple room). Bout 10 minutes from the beach which was great. This hotel is a good decent stay. We had a good sleep and good rest. The top ‘bar’ is still under renovation/construction so not all facilities are customer ready. Anything is wonderful here.Many kinds of tasted food around hostel and it’s very peaceful all day. With a solo traveler budget , i tried to find hotel with a reasonable price . So, I've been to quite a few cheap hotels in Vietnam and this hotel is definitely one of the best. They arrange me a upper-floor room and it was full of nature light. I felt great when wake up on the morning . The facilities were awesome, comfortable bed and strong wifi. Finally , i just want to say that this hotel service is beyond excellent!. The staffs are very friendly quick with a smile and do the best to help me .It makes me feels like at home. I will comeback next time. The hotel has good and friendly6staff that also speak english. It is a about a 10 minute walk to a nice area on the beach (on the same road, easy). The rooms were clean and spacious with comfortable beds and pillows (was not expecting that). Also lots of local restaurants nearby if that's what you want. Otherwise international restaurants are near the beach. Dear Craig, Thank you very much for your kind words. We are more than happy to hear that you enjoyed your stay with us. We always try to make guest pleasant and hope that you still choose Hanami hotel if you have a chance to Da Nang again. Thanks & Best regards! Dear valued guest, Thank you for trusting us. The hotel will try to limitations and improve the quality of the hotel. Due to the severe weather conditions, I think air conditioners are not cold enough .Always welcome you back to the hotel hanami in a nice day Thanks and best regard! I stayed during the busy long 4 day weekend, and the only apartment they had available was on the second floor which faces the entrance lobby from the window. But it was still nice. The kitchen did not have a kettle which was a bummer. So for instant coffee, I had to boil the water via the cooking pot they provided. The bathtub/shower area did not have any curtain or shower door, so literally the whole entire bathroom will get wet. Basically, it is a "wet shower." There was plenty of hot water and good water pressure. The staff were really nice and spoke Japanese. The owner even sent me to the airport for free of charge. Oh yes, location wise, it is perfect as you can walk to the local street with tons of local food you can choose from unlike those touristy restaurants near the beach. You can walk to the beach easily as well. Dear Shuri, Warmest greeting from Hanami hotel. Thank you so much for taking your valuable time to write lovely review. We are pleased that you were well taken care of during your stay. We will do everything in our power to meet our guests’ needs the best way we can. This feedback is a big promotion for us to serve customers better in the near future. If you’re traveling to Danang city again soon, don’t hesitate to call us. Best regards! This hotel is clean and very friendly. The staff are polite and go beyond to help with your stay and any travel plans you may need help with. I will be staying there again when I return to Da Nang.